Thanks to the collaboration of some very hard-working organizations, there is a new inclusive playground ready to welcome children and families of all abilities. On Saturday, July 11, Shane’s Inspiration along with First 5 LA, the Los Angeles Department of Recreation and Parks, Too Small to Fail and the Exceptional Children’s Foundation hosted a grand opening to celebrate the new Landscape Structures inclusive playground at Sepulveda Recreation Center in Panorama City, Calif. The playground offers a train theme with custom play structures that mimic a train depot and train cars, and all of the structures are designed to welcome children of varying abilities. Even more, this playground is the first in the country to highlight Too Small to Fail’s “Talking is Teaching: Talk, Read, Sing” campaign to boost children’s early language development. 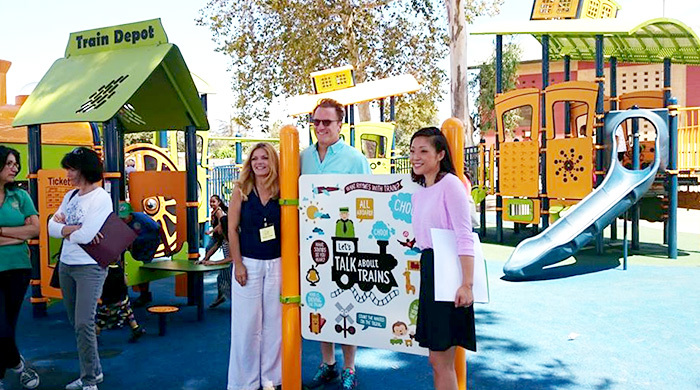 The playground at Sepulveda Recreation Center incorporated the Talking is Teaching materials into playground signage to prompt fun conversations, stories and songs while parents and children play together. We’re proud to collaborate with Shane’s Inspiration and Too Small to Fail to support families build a foundation of early literacy skills and help close the word gap. Learn more about our commitment to the Too Small to Fail initiative. Today marks the eighth annual World Autism Awareness Day. This day brings autism organizations around the world together to help raise awareness about the disorder affecting nearly 1 in 68 children. Because of these stats and the fact that there are one in seven children in the U.S. living with a disability, we took a close look at public playground requirements for children with disabilities by conducting a survey of nearly 900 parents of children 12-years-old and younger. More than half (57 percent) of all parents asked about playground requirements for children with disabilities, mistakenly believe playgrounds are required to have elements designed for children with autism spectrum disorders, Down syndrome, and visual and hearing impairments. That means that people who think they’re designing an inclusive playground based upon ADA standards are really only designing to the minimum requirements and could be missing a huge need in their community. Over the past few years, we’ve learned about a desire to include sensory play experiences and multigenerational opportunities for social interaction. Planners also want to make sure the community or school playground offers enough challenge for children who are typically developing as well so that there are opportunities for healthy interaction among children of all abilities. Our survey echoed that idea… nearly 75 percent of parents believe it is important that their children have an opportunity to play with a variety of children, including those with disabilities. Overall, when planning an inclusive playground, inclusion should be used as a guiding principal—a checkpoint that you continue to question, “How are we fulfilling this need?” Learn more about inclusive play at playlsi.com, and see more results from our Inclusive Play survey. 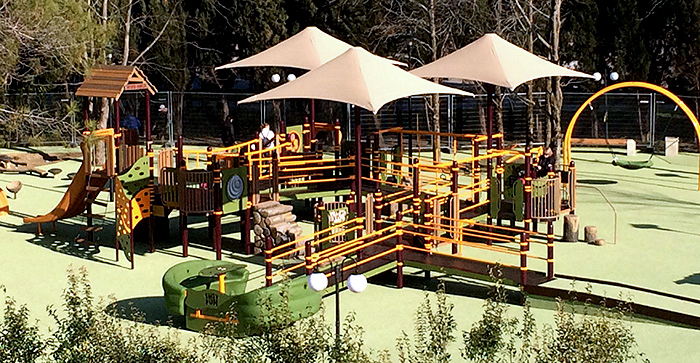 This week marks the one year anniversary of the opening of the first inclusive playground in Russia. Together with our partner in inclusive play, Shane’s Inspiration, we designed the fully inclusive and accessible playground to deliver a nature-inspired play experience. The natural playground design in addition to the sensory-stimulating and developmentally appropriate activities will welcome children and families of all abilities. The installation of the accessible playground equipment was in association with the 2014 Olympic and Paralympic Winter Games in Sochi. Read more about this playground first here. We recently began collaborating with the Sensory Processing Disorder (SPD) Foundation and its sister organization, the STAR (Sensory Therapies and Research) Center, to help bring more awareness to the disorder, and help share the important work that the Foundation does to treat adults and children affected by SPD. Our collaboration has led to the creation of a sensory playground at STAR Center, which is helping move SPD therapy outdoors. Playgrounds are an important part of children’s lives. They provide opportunities to play, learn and socialize. Because of this, the inclusive playground at STAR Center will be used as a therapy tool and this “natural” setting will be incorporated into children’s daily lives. The STAR Center also focuses on parent education to help them understand SPD and intervention principles. Parents are coached to prepare for their child’s sensory needs, and families receive help to facilitate a “sensory lifestyle” for the whole family. We’re excited about this new collaboration with the SPD Foundation and STAR Center, and look forward to learning more about how therapy in natural settings—especially playgrounds—helps treat children touched by the disorder. Steve King was honored with the Visionary Leadership Award from Shane’s Inspiration, a nonprofit organization specializing in the design and educational programming of inclusive playgrounds, at their annual gala on April 21. King, the cofounder of Landscape Structures Inc., the Delano, Minn.-based commercial playground equipment manufacturer, was recognized for his commitment to providing inclusive playground equipment for children of all abilities as well as his philanthropic support of Shane’s Inspiration’s abilities awareness programs. Since that concept was introduced, King has continued to build upon it. 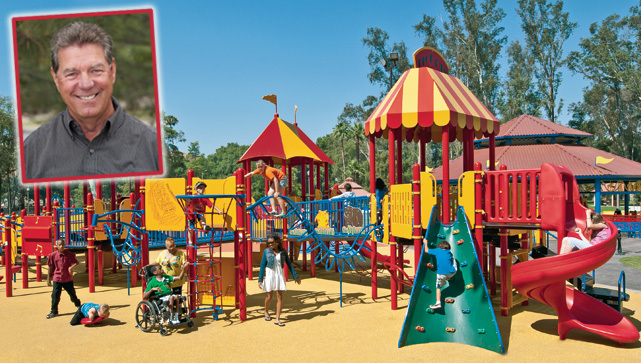 He has committed his entire life to creating play spaces for children of all abilities. King was chairman of a task group of the American Society for Testing and Materials (ASTM) that worked with the U.S. Consumer Products Safety Commission (CPSC) to update the ASTM F1487 Specification, a voluntary safety and accessibility standard for public playground equipment designed for children ages 2 to 12. His task group had the added responsibility of developing playground accessibility standards to comply with the Americans with Disabilities Act (ADA). In addition to his commitment to providing truly inclusive playground equipment, King was honored for his continued support of Shane’s Inspiration. King and his wife and cofounder of Landscape Structures, Barbara (1946-2008), met Catherine Curry-Williams and Tiffany Harris, cofounders of Shane’s Inspiration, more than 10 years ago. 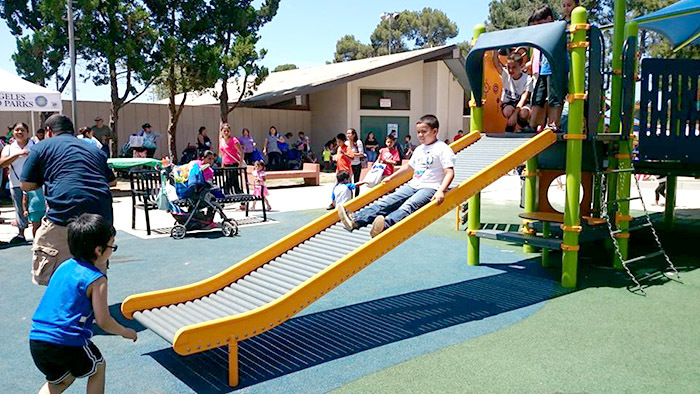 Since then, Shane’s Inspiration and Landscape Structures have partnered to design and install more than 30 inclusive playgrounds throughout the U.S., Canada and Mexico.